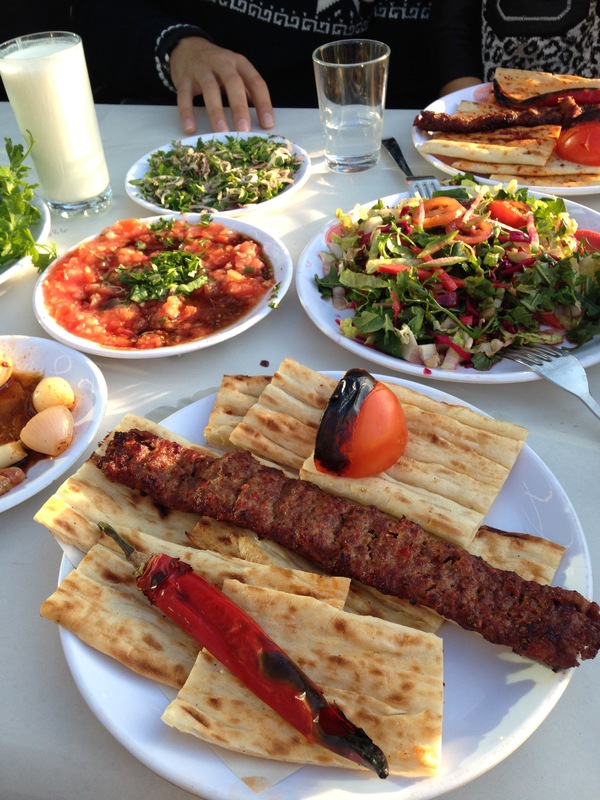 Adana Kebab is what makes the intense summer heat of Adana bearable. It’s what makes long stressful workdays manageable. It’s what makes a loss by one’s favorite football team endurable. Basically, Adana kebab makes anything better. It is absolutely delicious, and though you can find Adana kebab on menus throughout Turkey and throughout the world, it is never as good as you will find in Adana. It definitely makes this city worth visiting. Turkish cuisine in general is amazing. Tomatoes, onions, peppers, and garlic are staples, along with parsley, yogurt, eggplant and meat. With these items, as well as some olive oil, salt, and paste made of peppers or tomatoes, culinary options are endless. 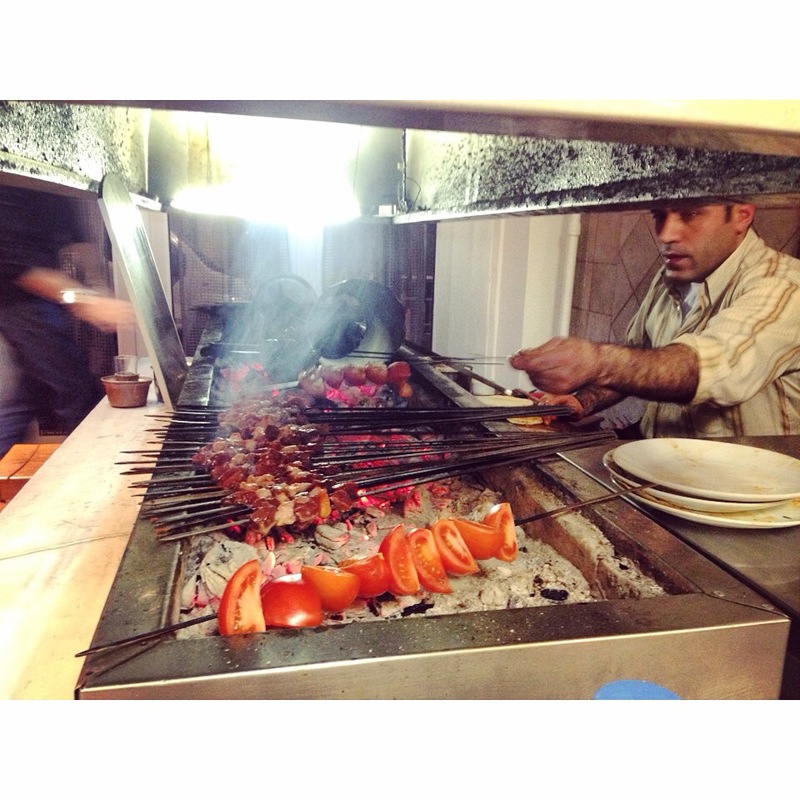 There are sooooo many types of kebab (check out this List of Kebabs and imagine many more!). Before I came to Turkey, I have to admit I thought there was just one basic “kebab” or method of skewering meat, and I was anxious to discover it. However, I soon learned kebab could mean ANY type of meat, generally skewered yet often not served so, roasted over a piping hot flame. Mangal is essentially the Turkish term and style for barbeque outside, and an ocak başı refers to a hot grill operating indoors. People often have wood-fired ovens built into the wall of their balcony, and though I have seen these used for storage, these are great places for roasting up some delicious kebab at home. Pictured here is chicken, but this represents a fairly typical Turkish grill. You can find a recipe and detailed method of how to make your own Adana kebab at home wherever you are in the world from The Food Lab, a great column from Serious Eats. The author includes a disclaimer which I feel I should include as well. Of course perfect Adana kebab takes years of mastering and can only be prepared by a seasoned usta, or master chef, but perhaps this will put your cravings to rest until the next chance you get to visit Adana and gorge on all the glory that exists in meat form there. 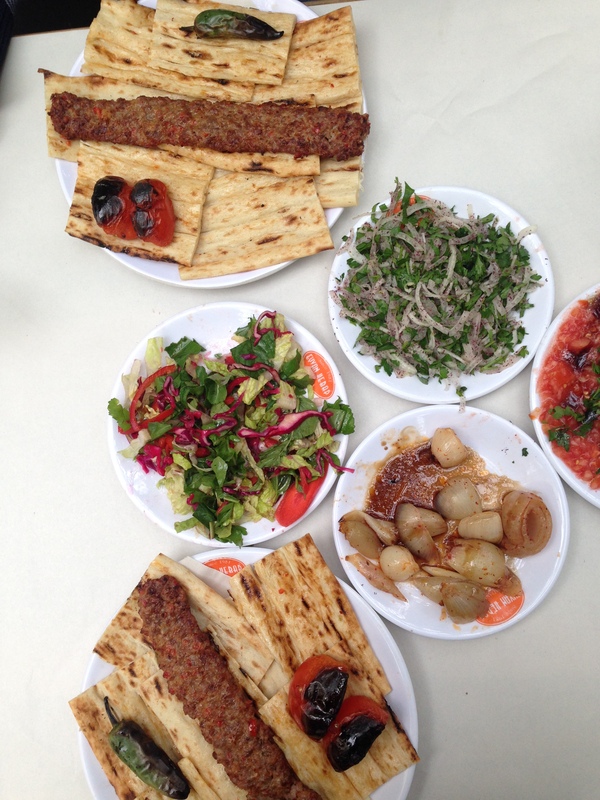 Something to note (and further tempt you to book a journey) is that ordering kebab in Adana essentially means ordering up a table full of complimentary salads and sides that go along with it. There is no rice served with kebab in Adana, rather ample pieces of flat bread that were resting below the meat while it was roasting, so that drips of goodness have soaked into these bread pieces. There will inevitably be roasted peppers, onions, and tomatoes served up alongside your kebab, as well as various salads, greens, perhaps a yogurt dish or two, and my favorite Adana kebab addition, onions and sumac, among other things. 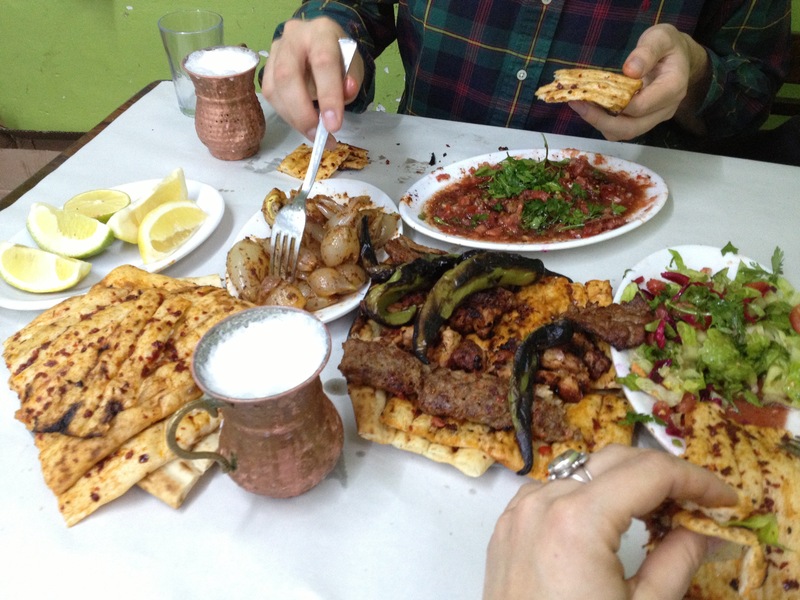 You can always count on a full table of delights in Adana, even for just two people. 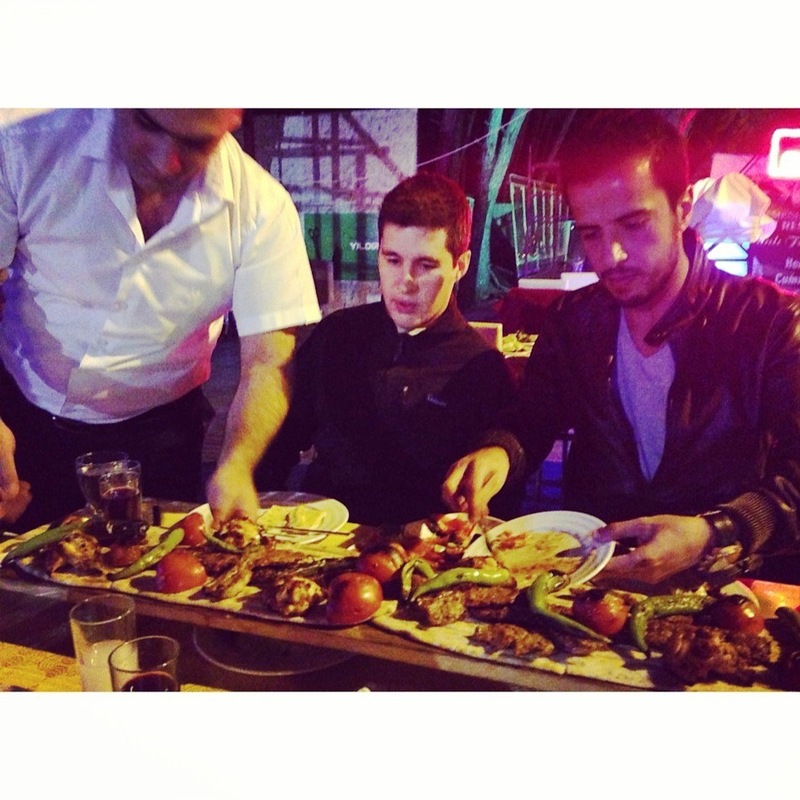 Upon arrival at a typical kebab restaurant in Adana, one must first determine the ideal table. The host or often manager himself will undoubtedly assist you very eagerly in this task, suggesting a number of locations depending on where your analytical gaze falls. After making this decision (or having it graciously made for you) the next step will be ordering your meat. Generally you will not be presented with a menu, rather the waiter will appear in a rush ready to take your order. You can ask what is on offer that evening, or just go ahead and choose “Adana,” though you should also determine if you would like a single portion size or a portion and a half. The single portion is filling for most anyone, but once you start eating you might not want to stop, so keep this in mind. The other decision on the table will be your choice of beverage. Many great kebapçıs do not offer alcohol, but this should not deter one from dining there. There are also many that do, so if this is important to you, be sure to check beforehand. Personally I will only accept one of three beverages with kebab: ayran, spicy salgam, or raki (served alongside salgam). After these decisions are made, your table should start filling up within minutes. 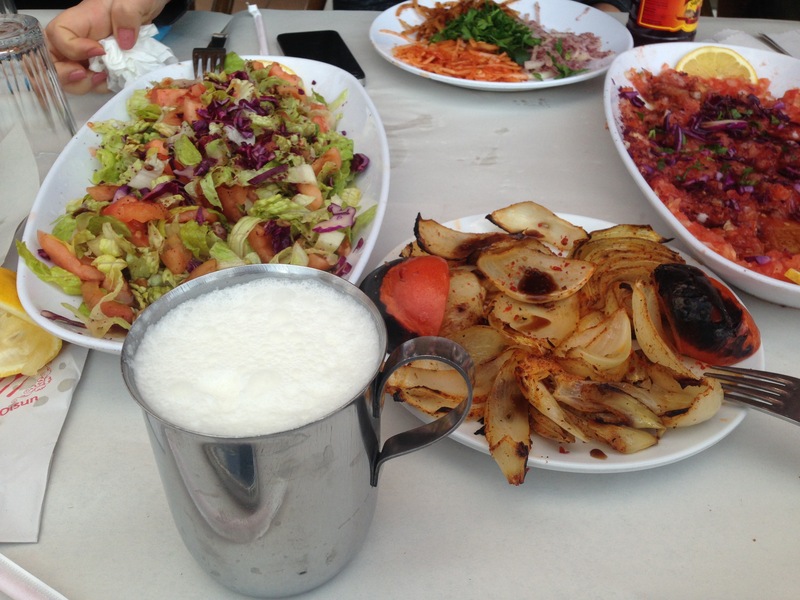 The traditional copper cup ayran is served in helps keep it cool and frothy. If you are lucky you will be served in more of a bowl-shaped copper cup and ladle the ayran out with a deep spoon to maximize on the froth. For more details on delightful fermented dark carrot juice check out this post on şalgam. Once the steaming meat is delivered, how should one handle it? Cut portions and consume politely with a fork? I mean, you can. But really, ideally, you should place a 1.5 inch section of kebab meat into the fold of a section of oil-dripped red pepper-encrusted bread, and top with some onion-sumac salad and maybe a bit of a tomato salad. Or, just continuously take forkfuls of the various salads between bites of meat and bread. As always, allow yourself to get a bit messy. There will be drips, and your fingers will not remain clean. Kebab requires clean up and a thorough hand washing afterwards. 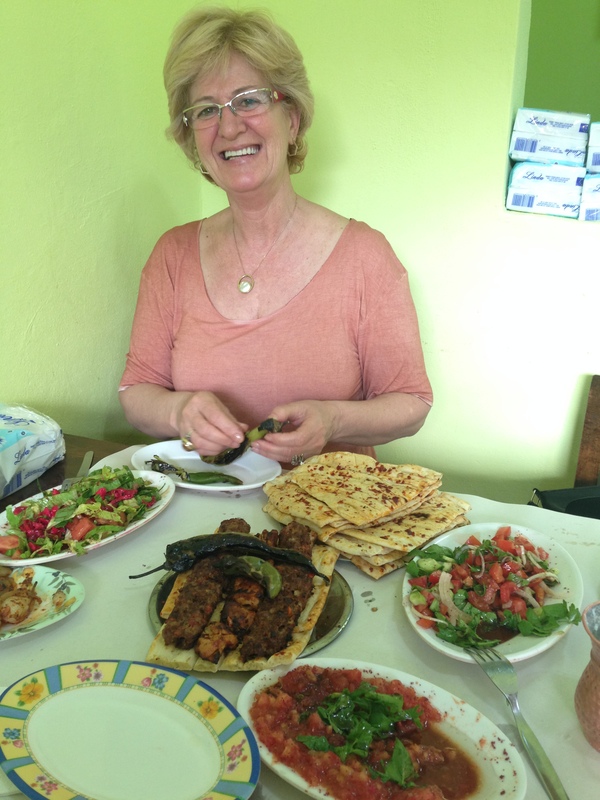 While many people have a favorite usta, or kebab master, and a favorite spot for feasting on kebab, many locals will also tell you any location in Adana is as good as the others. I happen to disagree, and while I unfortunately have not tried every kebapçı in town, I have a few favorite go-to restaurants. 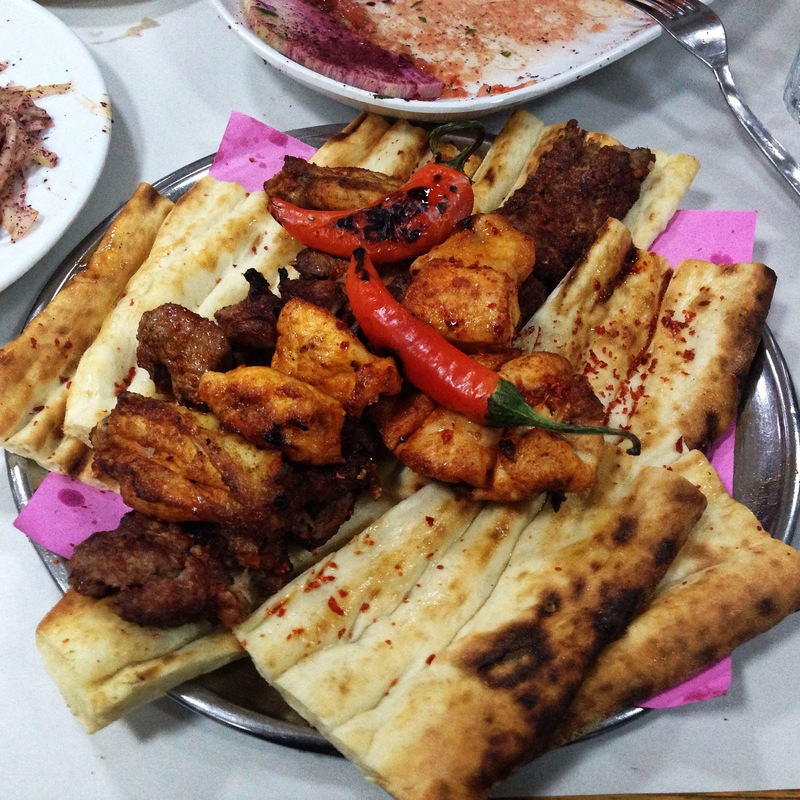 Although I can’t seem to rank these in any particular order– it just depends on the circumstances or my mood– here are five of my go-to spots for kebab in Adana. Usta means “master,” in this case “of the grill,” here pictured inside. Located downtown just a few blocks from the football stadium, Yeşil Kapı is essentially a two-story home converted into a restaurant. Not fancy by any means– food is delivered on white plastic plates yet generally devoured using only the paper tablecloth as one’s feasting space, with entire packets of napkins and wet wipes awaiting customers at each table– the food more than makes up for the atmosphere. Customers pass by the kitchen area as they climb upstairs, and you can’t help but come away smelling of the open grill located in the center of this green structure. If it’s not too busy, guests are often seated in their own private rooms, on small homemade wooden chairs. Regardless of how close the next table is, feel free to roll up your sleeves and get messy! 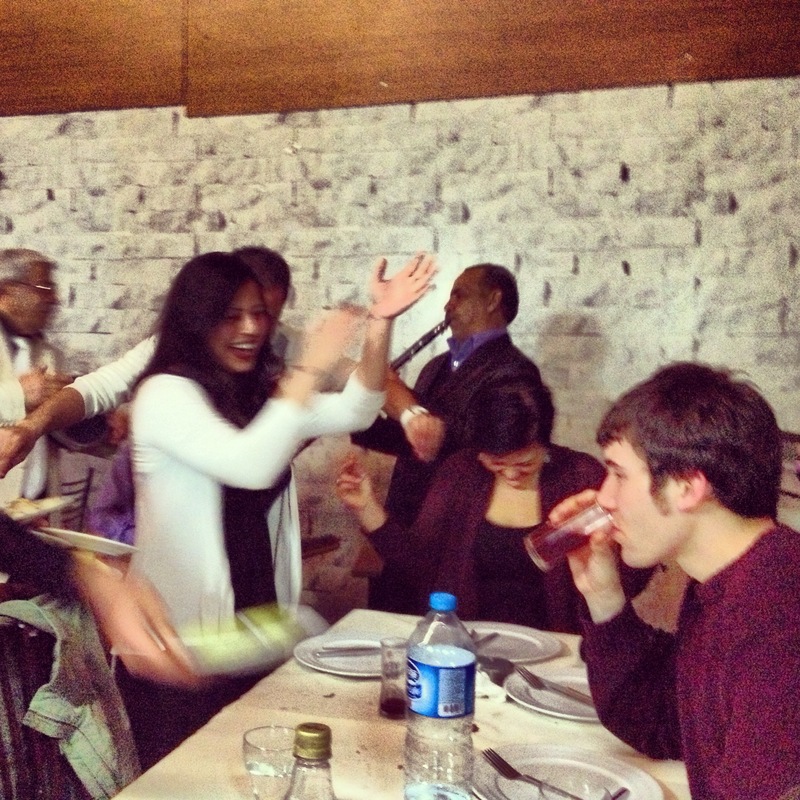 Feasting with my families in our own room at at Yesil Kapi in downtown Adana. Bol kepçe might not be easy to get to. Since it’s out in the far reaches of Yüreğir near İncirlik you pretty much need a car to get there, and even then it takes up to thirty minutes if there’s traffic. However, some people would label it the best. 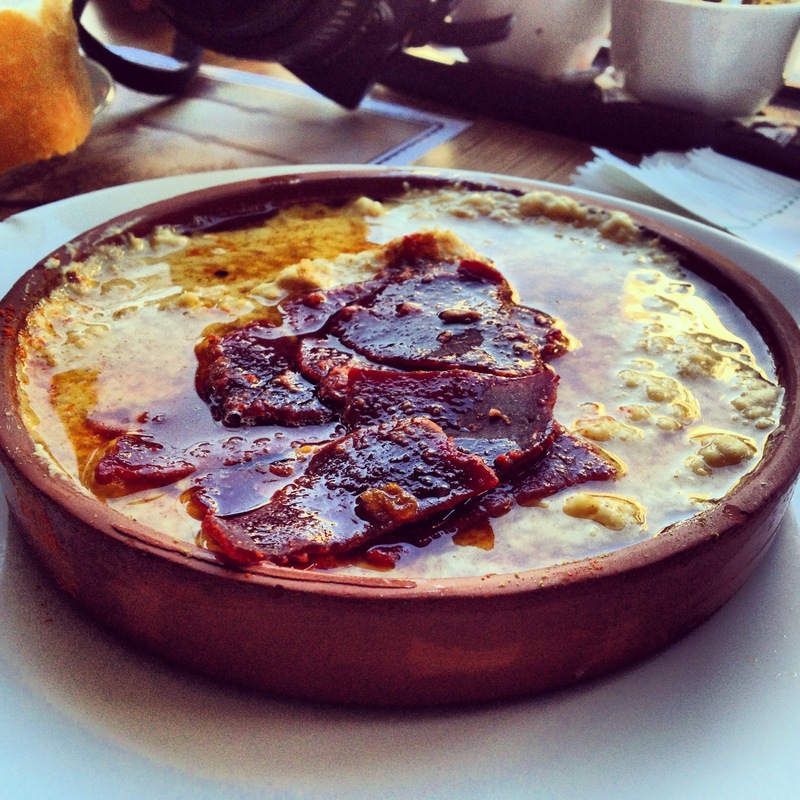 I would suggest skipping any meals prior to visiting Bol kepçe, since the portions are more than ample. The standard comes with some chunks of chicken, chicken wings, and a few other pieces of meat in addition to the minced kebab itself. 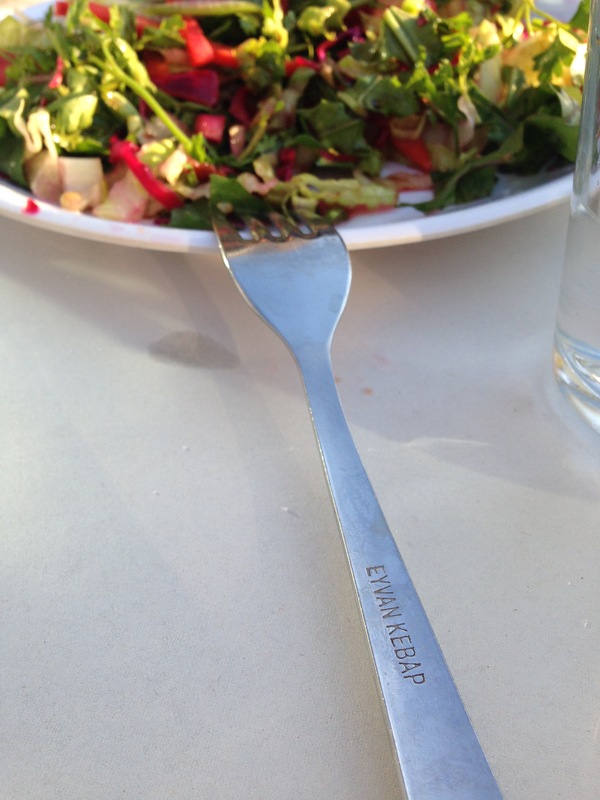 Bolkepçe also serves up some mighty good salads and side plates– all complimentary, of course. Fantastic salads such as this keep you satisfied while your meat sizzles on the grill. Plates get piled on top of one another, and when a salad is finished, out comes another heaping portion. So beware! Eyvan is my favorite weeknight go-to. There is one in the old city center and one on Turgut Özal Boulevard, the main very long drag in Adana, which is the location I prefer, though I have met people who swear by the downtown location. The sounds of the small waterfalls provide a relaxing outdoor ambiance at the Turgut Özal location, and there is also a nice play area for children. Everything on the menu here is basic and delicious, but it’s so good it’s difficult for me to not order the class kebab. 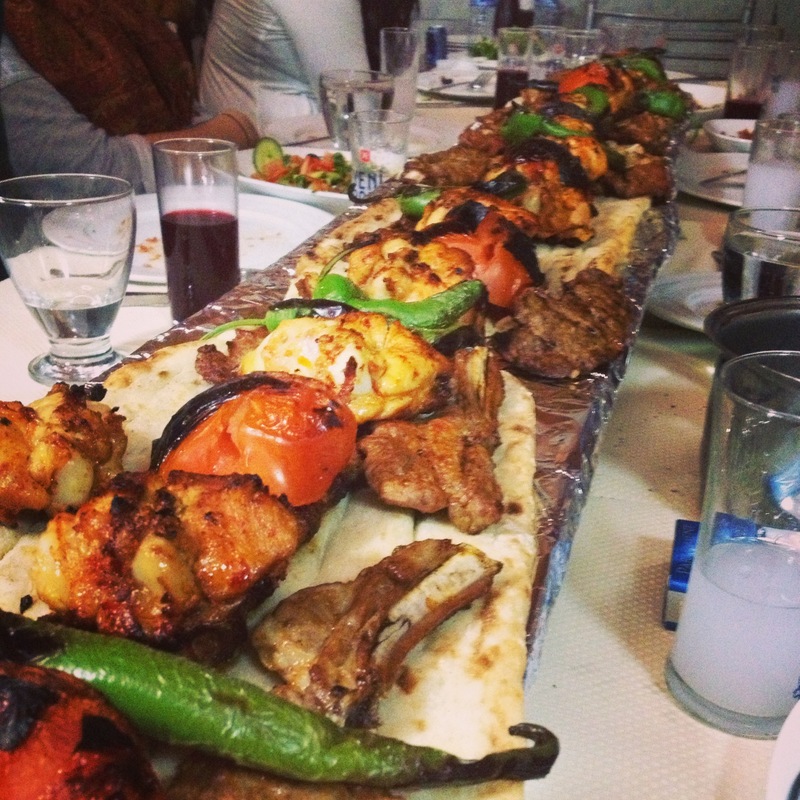 Meşhur Hadırlı is where I tend to take guests who are in town who want to make a night out of out kebab feast. The food is good, the service is excellent, and there is always a live band playing Turkish music you can dance to. 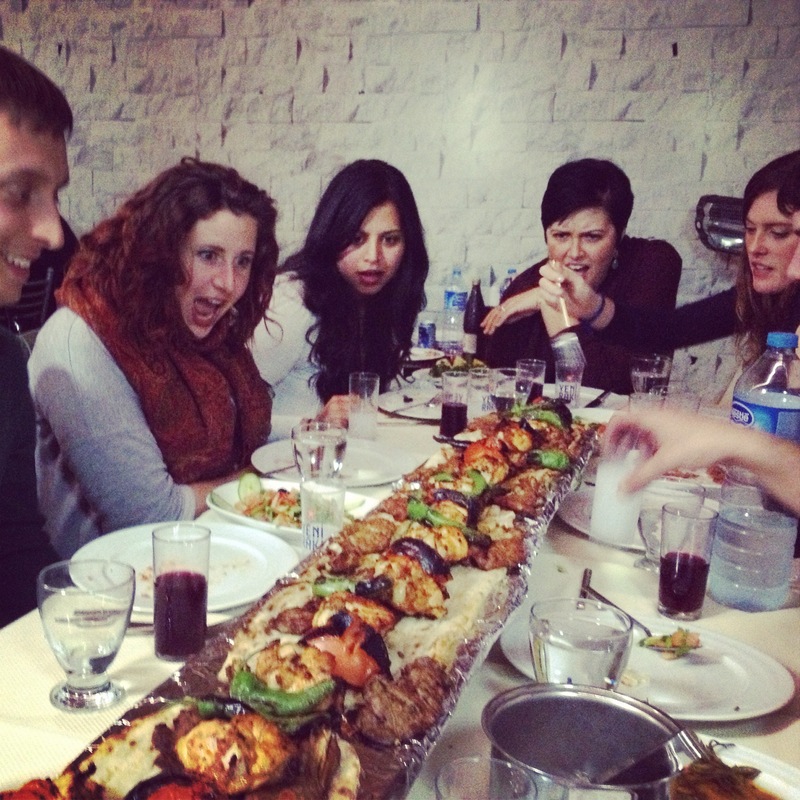 I’m not sure how standard it is, but we generally manage to get a meter-long kebab brought to the table, and guests never fail to be impressed. Add raki, salgam, too many sides to mention, live music and dancing, plates of fruit to finish it all off with, and this makes for a memorable night for all. Even with a full belly, it’s hard to pass up dancing with these guys around. Devouring this is serious business. 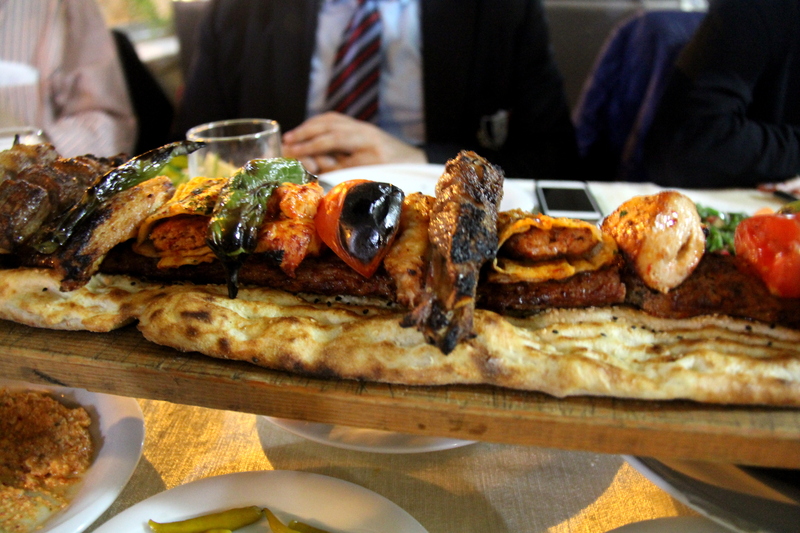 The last on my short list is a long-time classic, and claims to be the home of the meter-long kebab. 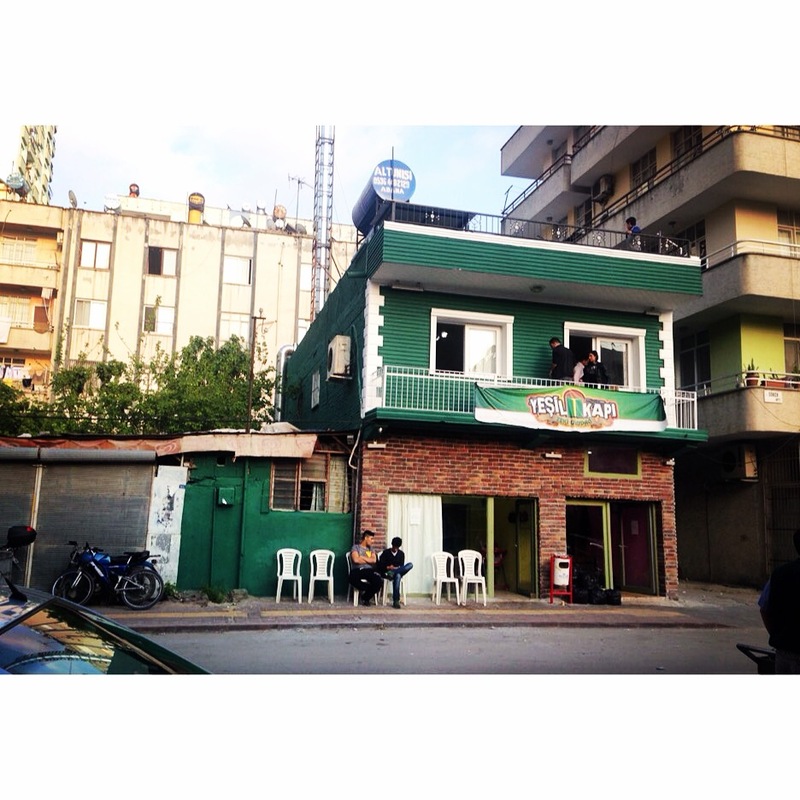 Located at the edge of the Seyhan Lake on Adnan Menderes Boulevard, the location is great, but the food is even better. This family-run operation has a long history in the region, and is generally bustling, whether you visit at lunch or dinner. For more information in Turkish visit the Hasan Kolcuoglu website . 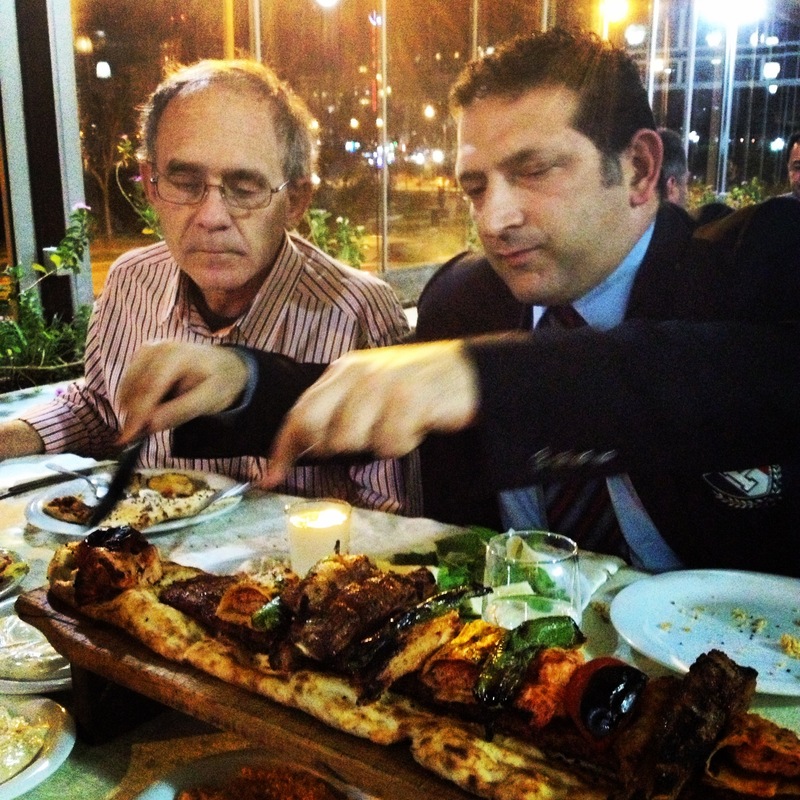 Mom and dad’s first kebab, so it might as well be, oh, say, a METER LONG and served with all kinds of other delights. Many kebapcis offer hummus beforehand. The best kind is with pastirma on top. I understand many would label this as sacrilege, but I have discovered ONE valid location in Istanbul for actual Adana kebab, served correctly. Yes, it is significantly more expensive than places in Adana, but I suppose that is to be expected. 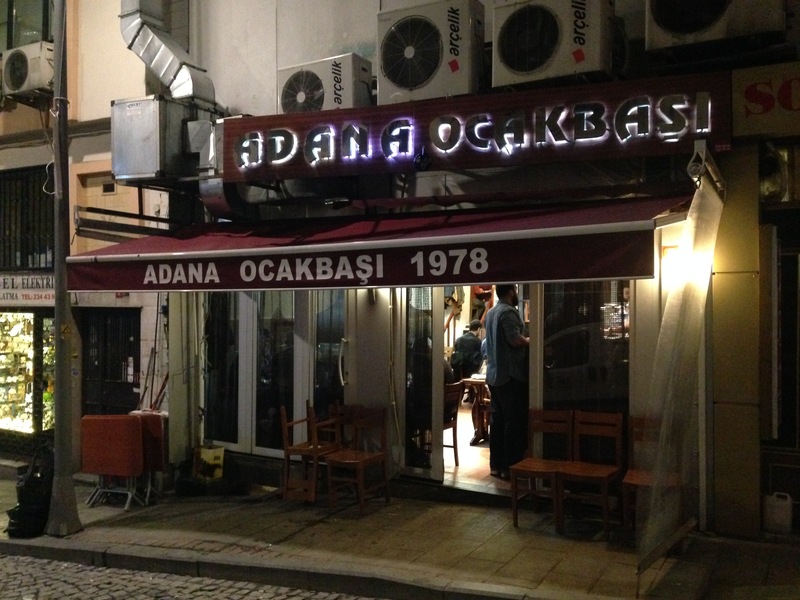 If you are in Istanbul and need a fix, it is nice to know there is at least one decent option, which is Adana Ocakbaşı in Kurtuluş. Here tables surround the open grill, where the usta is hard at work, often handing customers plates of meat fresh off the grill. And of course, let’s not forget the dear souls who so graciously lend us their lives so that we can indulge. Thank you to all the sheep. Thanks to the sheep of Turkey, who generally seem to lead a nice life, roaming about and feasting on nature, which makes the meat they provide us so much tastier. I hope for your own sake you will find yourself in Adana at some point before long, and if you do, don’t think twice about eating kebab every day. You just should. Once you do I’d love to hear your favorites! Afiyet olsun! My favorite was some old Turkish gentleman who set up his mangal across from the Incirlik pub. He served a ground chicken kebab in pide with red onions, tomatoes, and spices – wrapped in newspaper. I have since learned how to cook turkish foods but never made kebap. I plan to do so in the coming weeks. (I found this while brushing up on long-dormant memories.) Thank you for taking the time to write this.